Never say never, as the expression goes. But a comment on Twitter earlier this week piqued my interest in the viability of mobile booking in the travel industry. It also led me to read the latest Skift Trends Report: The Rise of Mobile Booking in Travel. This response ended our 140-character repartee, but initiated this blog post. Maybe we could use a little perspective on mobile bookings in this big, diverse industry of ours? There’s no question that mobile bookings – either through smartphone apps or via mobile-optimized websites – are on the increase. Early in the Skift Trends Report, a reference to a study by eMarketer states that mobile travel sales reached $13.6 billion this past year, up from just $3.4 billion the year prior. I’m not exactly sure of the methodology used in defining “travel sales,” but the study predicts that by 2017, this will reach nearly $50 billion, or 29% of all travel sales. The Rise of Mobile Booking in…the Hotel and Rental Car Industries? That’s remarkable growth. But as I got further into the report – which provides some other surprising statistics, interesting interviews, insights and strategies for mobile bookings – I concluded that it probably should have been entitled, The Rise of Mobile Booking in the Hotel and Rental Car Industries. That’s where all the action is currently, and confirmed my suspicion that other segments of the travel business simply don’t lend themselves to mobile booking, now and likely for some time to come. Skift says as much: “Booking air travel on mobile is somewhat less popular [than hotel rooms or rental cars],” and other industry segments are left out of the report entirely. Some interesting graphs do show that while smartphones and tablets are avidly used in research, most travelers resort to their laptop or PC by a wide margin when it comes to pulling the trigger; i.e. actually buying a travel component. Surveys cited in the report suggest this is attributed to poor website design, outdated legacy user interface and cumbersome payment processes. That might be true for those wishing to book a hotel room, rental car or airplane seat with their smartphone. But for my money, and apparently for the money of those booking cruises and tours, these aren’t the main reasons. No disrespect is intended by my use of the term commodity products – I’m not talking about soybean or pork belly futures – and there’s even room here for luxury brands, full-sized cars and business- or first-class airplane seats. They’re still commodities, and are generally purchased as discrete elements, with a clear eye as to exactly what is being purchased. Tours, cruises and even most resort stays aren’t in this category. Sure, there are certain commonalities about a seven-night cruise to the Caribbean aboard mass-market cruise ships. But the differences even here make booking online – not to mention mobile booking – difficult. While it’s not cited in the report, Skift earlier this month wrote that travel agents and telephones still rule cruise bookings, and that estimates put online cruise bookings at just 7% to 10% of the market. “The seas are littered with travel startups that over the past decade have tried to make online cruise-bookings the norm. You don’t see a huge amount of venture capital money pouring into the sector,” noted the article writer, Dennis Schaal. Along with some of those quoted in this earlier piece, I expect this will gradually change, particular among past cruise customers who are comfortable with a well-known brand and with streamlined online processes. But we’re still quite a distance away from mobile bookings, in my view, even for what I’ll call the price- or entertainment-driven segment of the cruise industry. We’re even further away for more specialized segments of the industry: substance-driven or knowledge-based cruise and tour products with longer research cycles. What do I mean by these terms? By substance-driven or knowledge-based products, I’m referring to cruises or tours where the focus is the destination. In other words, the ship is not primarily a floating entertainment palace and end in itself, as are mass-market products, but a means to an end. Passengers are more interested in historic and cultural insights, indigenous peoples or unique wildlife. This often entails visiting a remote locale not otherwise conveniently accessible; i.e. the Polar regions, the Galapagos, Upper Amazon and so forth. They are complicated purchases, giving rise to many, many questions, even among veteran travelers. Because these places are less well known, as are the brands and types of ships or tours that can take them there, prospective passengers tend to do a lot of homework before buying: e.g. comparing ships, companies, prices, itineraries, historic and cultural backgrounds, art and architecture, pre- and post-cruise extensions … hence, “longer research cycles.” It takes time. For an extended trip overseas, for example, how many of us don't have a file or two on our desktop filled with confirmations, emails, relevant articles, links and other material that we refer to constantly in the run-up to departure? Indeed, the Internet has been a boon for this sort of trip preparation, making it much simpler than ever before. And while mobile-optimized websites have facilitated this task for smartphone-wielding travel planners, I expect most trip research is still done with the keyboards and more commodious screens afforded on laptops, PCs or, increasingly, tablets. It's a fact that many of the cruise and tour operators that offer these sorts of knowledge-based trips are relatively small in comparison with the commodity (hotel, rental car and airline) travel providers. Many of the best are private or family operations that focus their energies more on delivering an excellent experience than on driving exponential sales growth or state-of-the-art CRM software. The Skift Trends Report is a good read, particularly in its coverage and statistics on last-minute, short-term hotel bookings made on the go. But it doesn’t really address more complex travel bookings and how mobile devices might have an active role beyond research and planning for more complex travel products. As I wrote in an earlier blog post, ships, even small ones, have a strong tradition of onboard libraries, guidebooks and handouts about the destinations visited. Why not replace these with files and apps that can be downloaded onto tablets and smartphones? This would allow passengers to manage all their information in one handy device, including emergency information, ship’s location and departure times, and links to relevant cultural websites. Some high-end around-the-world by private jet tours are already doing this … iPad included. 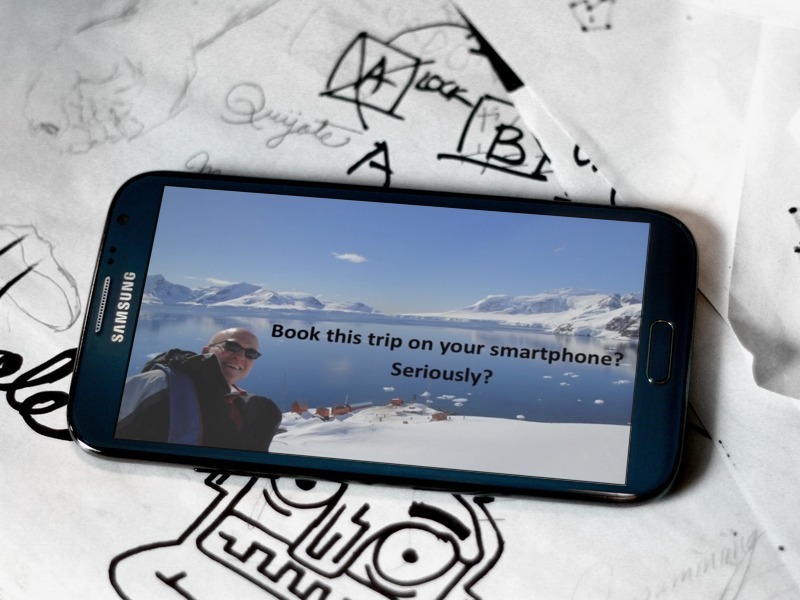 Great uses for mobile devices for knowledge-based travel products have just begun, but I don’t think mobile booking will be one of them for the foreseeable future. Do you agree? I’d like to hear your comments on this topic.